Captain Kevin has spent most days of his life on the water. He grew up in Southwest Florida and spent 6 years of his life in the Virgin Islands. Our guest marvel at his diverse knowledge of the waters. He has been behind the wheel of the boat entertaining guests for the past four years and he is known best for his knack of locating dolphins and having them play with the boat. Our guest love his gift for telling stories that are captivating and ability to make them all laugh which makes for an extremely memorable experience your family will be talking about for years to come. Captain Spencer was born with the wheel of the boat in his hands. He is a real MacGyver of the waters. The stereotypical camouflage-wearing astute fisherman/hunter that uses his senses like we use modern devices to tell the changing winds and tides. He truly is a master of the waters in every sense and can catch any fish in a matter of moments. He astounds us every single time with his diverse knowledge on everything nautical. His personality and gift for the waters really makes him such an asset that is guaranteed to delight every guest that gets to work with him. Captain Chez was born and raised in South Carolina on the island of Hilton Head, fishing always came naturally to him. He spent four years navigating the USVI and BVI from island to island. He has been navigating and fishing the waters of Southwest Florida since he moved here in 2014. Even when he is not navigating a charter you’ll find him on the water honing his skills. His great sense of humor, excellent teaching style and demeanor will ensure you a great day on the water. Chez, Madai, and their family spent the last four years living and boating in St. Thomas, USVI. This team brings the life of the Caribbean to beautiful Marco Island. 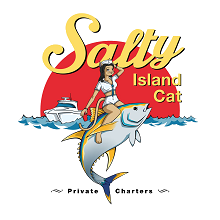 The Salty Island is a family business that takes pride in customer satisfaction and it shows! DISCOVER MARCO ISLAND, NAPLES AND THE 10,000 ISLANDS CONTACT US NOW!